Design Thinking and Mindfulness have taken the business and social sectors by storm. From making an iPhone, to designing worship, to renovating your kid’s bedroom, design thinking lays out the process of moving from dream to deliverable. But you can work a process and fail to be present, which is where mindful contemplation comes in. There are specific habits that can equip creative individuals from all sectors of the community to more mindfully engage the creative process. Convocation 2016 was a two-day experience of learning best practices for the design process: from dreaming, to doing, to listening, to resting. 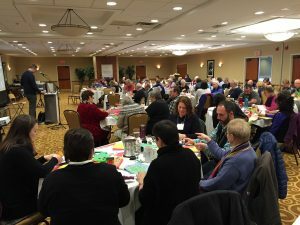 Attendees learned what makes some individuals and organizations successfully engage in the transformation of their immediate communities, while others work tirelessly without any noticeable change. And took time to observe their own creative process and the creative presence of the Holy in their own life. At Convocation 2016, pastor-artist and author Troy Bronsink led activities and conversations that get you out of your seat and encourage you to move—into your community as well as that interior landscape where your truest calling emerges. 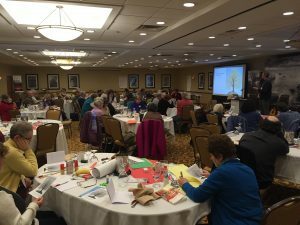 The gathering featured local artists and community leaders, who shared how they sustain their individual and collective works. Troy Bronsink is an author, musician, and retreat leader who works at the intersection of creativity and spirituality, where inspiration thrives. As a consultant specializing in the areas of contemplation and innovation, he works with nonprofits, design agencies, artists, activists and faith leaders. A PC(USA) minister, Troy holds an MDiv from Columbia Theological Seminary and is a leader within the emerging church. He is the author of Drawn In: A Creative Process for Artists, Activists, and Jesus Followers and currently lives in Cincinnati, Ohio, where he directs The Hive: A Center for Contemplation, Art, and Action. Below are a couple of photos from the event.